Suki's surgery will happen on Tuesday. Her family has set up a GoFundMe to help pay the $4,000 veterinary bill. 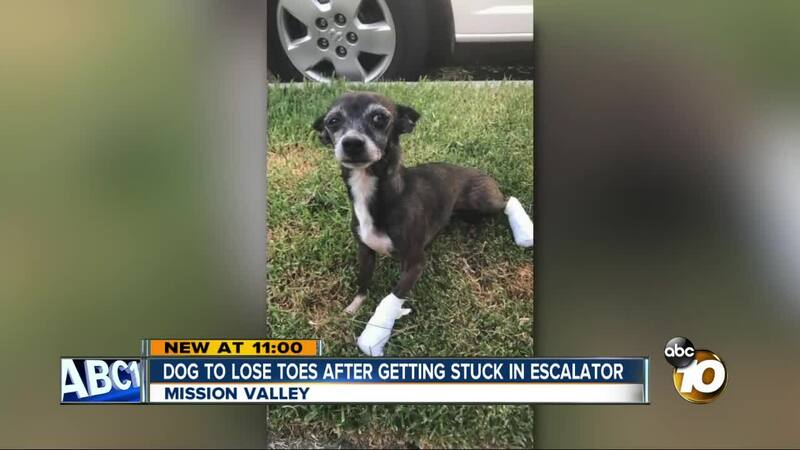 SAN DIEGO (KGTV) - A four-year-old Chihuahua was seriously injured at the Westfield Mission Valley Mall Monday. Suki will need to have two toes amputated after getting two of her paws caught on an moving walkway escalator. Josephine Ellis was dogsitting for her boyfriend's family. Her boyfriend worked at the mall and she told 10News she was bringing him breakfast. Suki was on a leash, and they walked up the escalator. The escalator is not the traditional type with steps. It is a conveyer belt on a ramp that takes people from the garage to the next floor. "I do remember making a gesture like "let's go,'" she said. "As I was walking to get off with her to jump off the escalator, her front left foot got stuck in the escalator, and all I heard was screaming and the next thing I know her other foot is in the escalator." She says someone had to stop the escalator so she could get Suki free. 10News visited the mall and saw that there are signs posted on the escalator that says dogs should be carried when using the escalator to avoid serious injuries, but Ellis thinks they need to be more visible. "The doctor told me that they’ve actually seen a lot of incidents where people have taken their dogs to the hospital because of (escalators). It’s quite common," she said. "It happens, it could happen to you, and I’m pretty on top of things, but today was a day where it’s a Monday, and I’m going about my business just trying to get things quickly done, but this happened. So you move on and hope it doesn’t happen to another pet."